Since our inception in 1985, Crumley Group has built several award-winning custom homes and completed extensive remodel projects throughout the Hampton Roads region. Our team of craftsmen is led by company president Scott Crumley. Scott enjoys working with his clients throughout the entire homebuilding process to translate their visions into reality. As a hands-on builder, he has the discipline and skill to manage a multitude of details and decisions required to build your home. Our expertise includes successfully orchestrating the most complex and sophisticated projects, while also welcoming the smaller projects. 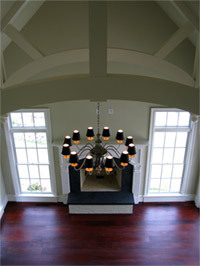 Each home we build is approached differently and is defined by you, the client. We are committed to meeting your expectations and pride ourselves in our ability to produce any style of architecture to create your unique dream home. Our hand-picked team has worked together for many years to deliver the highest quality craftsmanship, materials and service. We have proven time and again that personalized service and a true commitment to creating exceptional homes is the key to successful home building. We have great respect for our clients and are honored to have our names associated with each home we build. We look forward to the prospect of working with you and guarantee that creating your dream home with us will be rewarding and enjoyable.